This weekend, Krys and her son Dylan, daughter Julia, and I went camping at Charleston Lake Provincial Park. I only stayed Friday night and Saturday afternoon, as I had to do the music and sound for the service on Sunday morning. Unfortunately, after spending an entire night earlier in the week preparing all the recorded music and burning it onto a CD, I discovered that the Stereo at the Fellowship would not recognize the CD, which was a CD-RW. I had tried the CD in both my boom-box and the car CD player and it worked fine. This means that I will have to go and get another stack of blank CDs for the music. 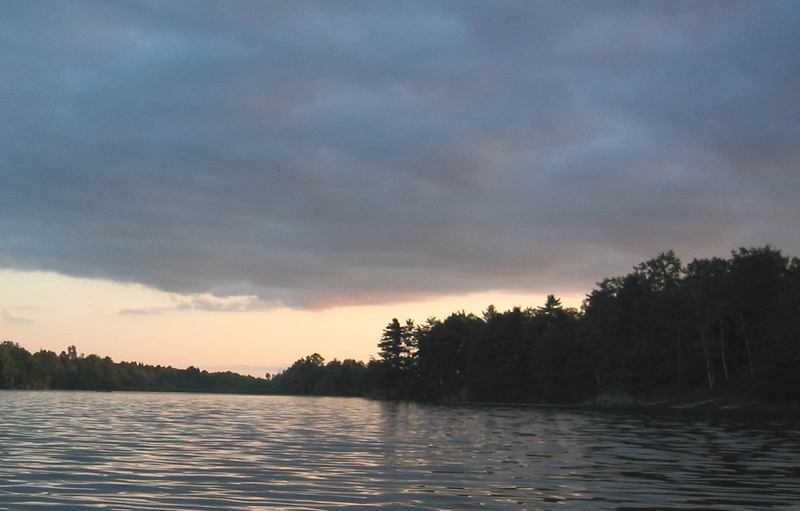 Anyhow, back to the camping…..
Charleston Lake is north of Landsdowne and Rockport, and in the Rideau Lakes. The area sits in what was once the boundary between two ancient bodies of water — Lake Iroquois to the southwest and the Champlain Sea to the east. The rock overhangs once sheltered the Native peoples of the area. Around the lake, you can see and hear lots of flora and fauna. Dylan and I saw an otter, and at night, we heard wild turkey. The sunsetand scenery were spectacular. Behind our campsite, you could see one of the rock overhangs I mentioned above. Between it and our campsite were a variety of mushrooms, the most spectacular of which were Red Wax Caps (Hygrocybe coccinea). Along the shoreline of the lake, we saw Closed Gentian (Gentiana clausa), Jewel Weed (Impatiens capensis), and a variety of lilies and orchids. There are two beaches and three campground areas which are fully serviced. Some have electricity. You can rent canoes and kayaks, and reservations can be made online, including 6 months in advance. It really was a wonderful weekend, despite my getting sunburnt, mosquito -bitten (Krys got a deerfly bite on her foot), and sore from canoeing for the first time in 10 years. Which of the “Seven Daughters of Eve” am I descended from? I was watching tv this evening and there was a part of a program which featured “Oxford Ancestors”, a company which offers DNA profiling of your matrilineal lineage, back to the “Seven Daughters of Eve”. Based on the research of Professor Bryan Sykes (which formed the basis for his book “The Seven Daughters of Eve”), and The “Seven Daughters of Eve” are the female seven ancestors of people of European descent. There are currently 36 identified marilineal ancestors for all of humanity. These “clan mothers” have been identified through an examination of mitochondrial DNA. By studying the mitochondrial DNA (mtDNA), which is the DNA inherited only from our mothers, these “clan mothers” were identified. Both men and women inherit the mitochondrail DNA, but it is only passed on via the mother. Because changes to mtDNA can be accurately calculated, these clan mothers can be pinpointed in history and location.